Whether we like it or not, winter is upon us! The bad news, you might not be able to wear your favorite Hawaiian shirt for the next couple months. The good news, you can now dress in layers, topping all of those layers off with a scarf. Scarfs, if worn right, can be an excellent accessory to however you decide to dress for the day. As you will see below, they can be casual or dressy and really come in handy on these bitter winter nights. 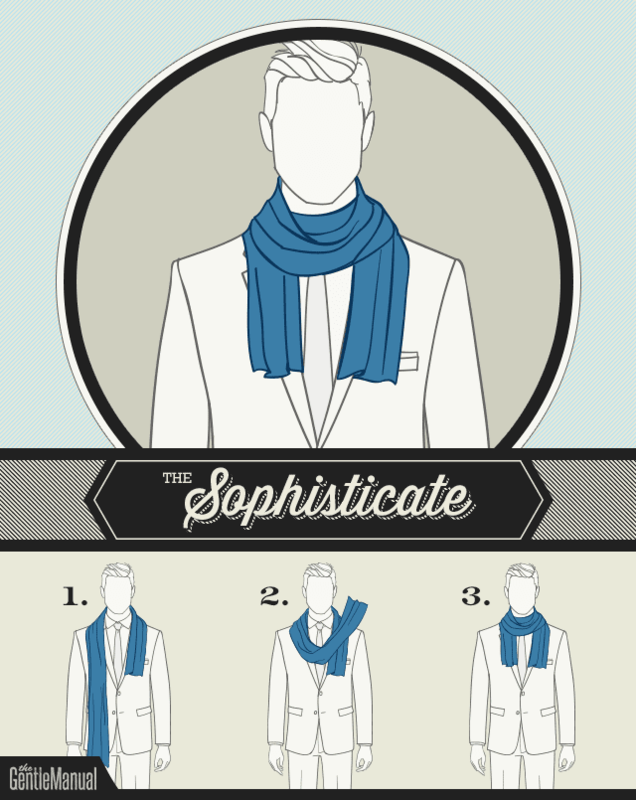 Our friends over at The Gentelmanual have put together some great tips on scarfs that we would like to share with you! 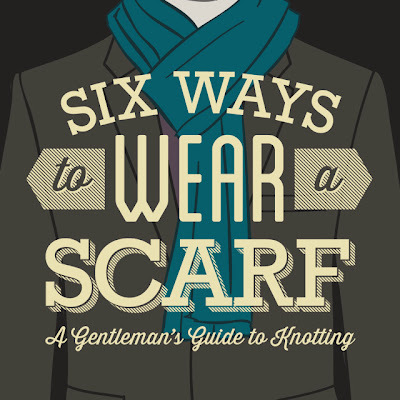 Besides a warm winter coat and polar bear repellent, a scarf is a gentleman’s best defense against the elements. But a scarf can be so much more than just frostbite protection. The right scarf knotted the right way can add boatloads of charm and personality to a your look—a great consolation during those frigid, unforgiving months of winter (or any windy, rainy, or chilly night). We’ve put together six of our favorite scarf knotting methods to illustrate the classic options a man should consider when bundling up. When out and about in the crisp city air, this classic knot is a no-nonsense choice that keeps your scarf neat and stylish with no fuss. Simply fold the scarf in half length-wise and wrap it around your neck, pulling the loose ends through the loop that was created by the fold. The City Slicker knot instantly adds a clean, put-together shape to your outfit, whether that be a cozy sweater and chinos or a dapper suit. 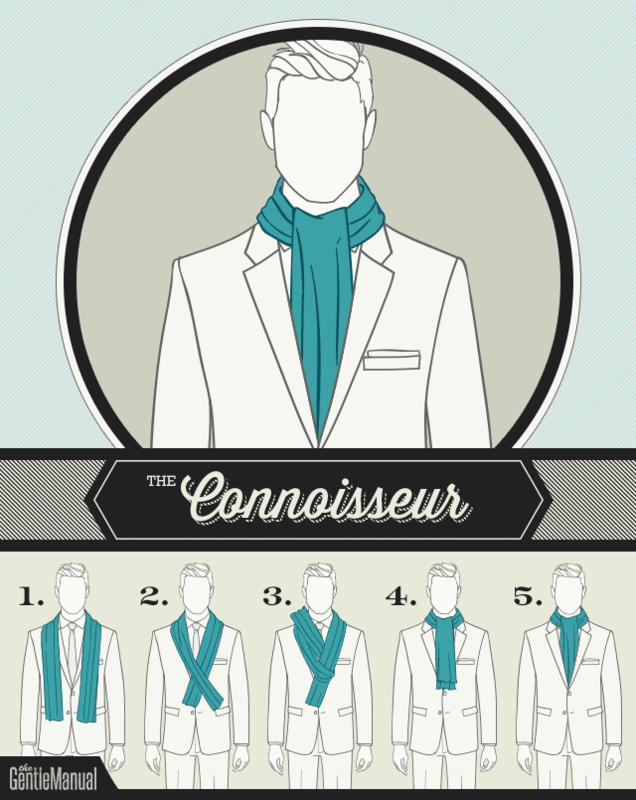 Because The Connoisseur is reminiscent of an ascot, it is perfect for a man who enjoys the finer things in life. 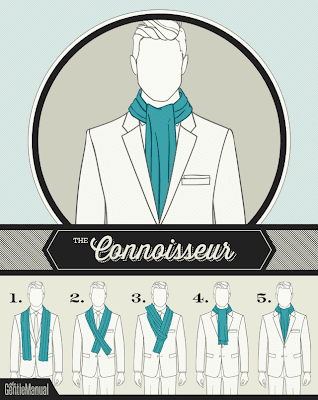 To create The Connoisseur, lay the scarf around your neck so both ends are even in the front. Bring one end over and under the other like a single knot. Drape the front end over the back and adjust length to your liking. This style can be worn loose (like step 4), but also looks great when tucked into a blazer or a v-neck sweater. The Connoisseur gives a refined air to your everyday garb. Look like a regular Harvard man with this elegant and studious scarf style. 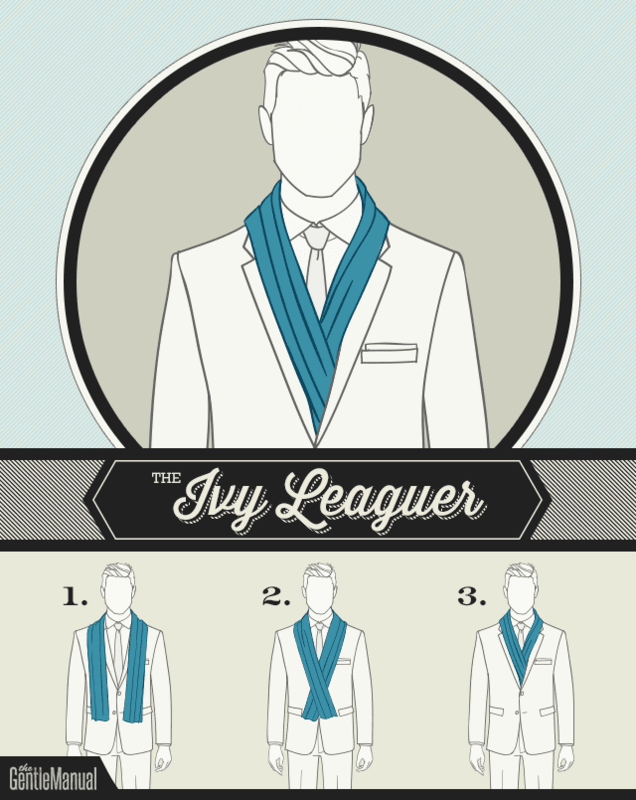 The Ivy Leaguer can go from very formal to a casual day look depending on the outfit and scarf itself. 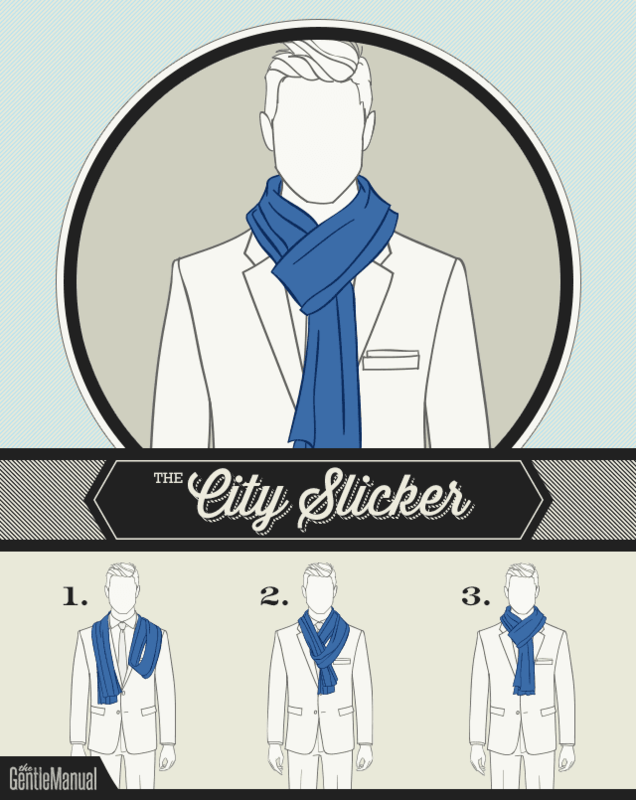 There are two variations: the scarf draped over the blazer (like step 1) or tucked under the lapel (like step 3). This style can be worn with an opera scarf over a tuxedo or with a blazer and sweater. Adopting this classic scarf style will give an effortless feel to your outfit. 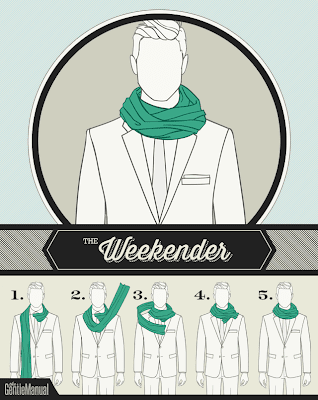 First, drape the scarf around your neck with one end shorter than the other. Next, wrap the longer end of the scarf across the front of your neck and let it hang over your opposite shoulder. If the scarf is extra long, wrap it around your neck once before placing it behind your shoulder. The Jet Setter will have you looking like a globetrotter in no time. This scarf style is the perfect balance between put together and laid-back. Drape the scarf around your neck, leaving one end shorter than the other. Wrap the longer end loosely around your neck once or, if you would like a more bundled look, wrap it around twice with both ends lying in the front. Allowing one end to be slightly longer than the other gives a more natural and spontaneous look, but the length can be adjusted to your preference. The Sophisticate style can be paired with anything from a winter coat to a T-shirt and cardigan. Like its name suggests, The Weekender is a more casual scarf knot that looks both contemporary and nonchalant. Start with one end in the front, close to your neck, and wrap the long end around your neck until it is short. Tuck both ends into the wrapped scarf and fluff out for preferred volume. As you can see, a scarf is an awesome way to set your style apart. Come in to Utah Woolen Mills and check our our collection of cashmere, silk-cashmere, wool and wool-cashmere blend scarfs starting as $95!